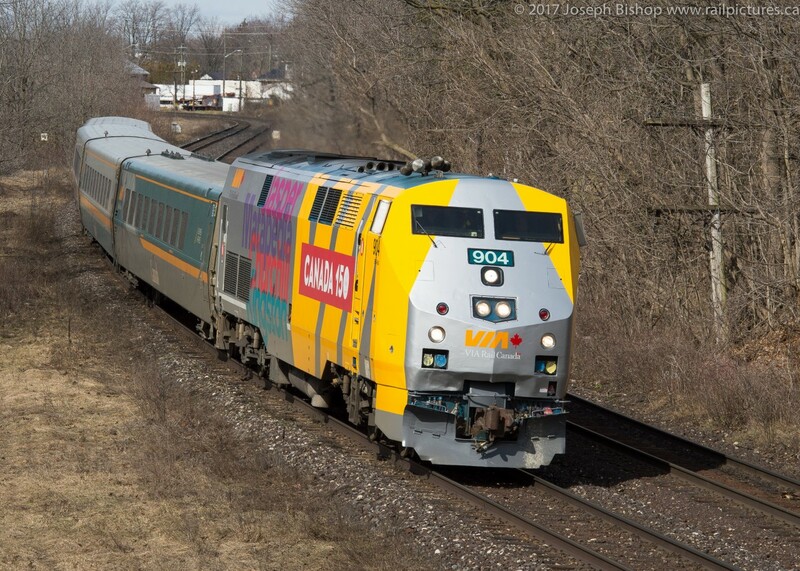 Railpictures.ca - Joseph Bishop Photo: Via 72 is lead by John Ave in Paris Ontario by GE P42 904 sporting a Canada 150 wrap. A well time suckerhole bathed the scene with sunlight just long enough for me to get my shots. This shot was inspired by James Adeney and his many amazing photos he took here when he lived in Paris as a young boy. I would like to pair this photo with his photo of Via 6532 the “Grey Ghost” whose scheme looks very similar to the 150th. The time machine photo can be found by clicking here This photo took quite a bit of tweaking to get almost identical to James’ shot, cropping and ensuring I had a sunny day was key. It could have been shot a tad wider but it is pretty darn close! | Railpictures.ca – Canadian Railway Photography – photographie ferroviaire Canadienne. Caption: Via 72 is lead by John Ave in Paris Ontario by GE P42 904 sporting a Canada 150 wrap. A well time suckerhole bathed the scene with sunlight just long enough for me to get my shots. This shot was inspired by James Adeney and his many amazing photos he took here when he lived in Paris as a young boy. I would like to pair this photo with his photo of Via 6532 the "Grey Ghost" whose scheme looks very similar to the 150th. The time machine photo can be found by clicking here This photo took quite a bit of tweaking to get almost identical to James' shot, cropping and ensuring I had a sunny day was key. It could have been shot a tad wider but it is pretty darn close! The bridge I was on was directly in front of the current one, but wasn’t as high. That is really cool Todd! Great job with that one as well! Your interest in stations is great and capturing them is well worth the effort. I enjoy it! Great work Joe. Glad you took the effort, and when I Saw this scheme I immediately thought of James’ photo! Keep in mind you stood on a different bridge then wee Adeney. Good effort!